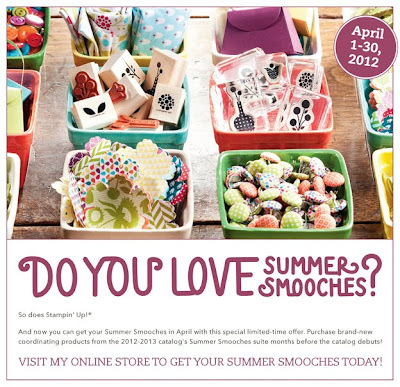 Today I made a card with my new Summer Smooches goodies. Love, love, LOVE the designer paper! You can get your hands on the new Summer Smooches Suite, too! Just visit my demo web site and order yours today. All you wonderful US demoes are making me jealous of the Smooches paper as think Australia won't get it til August. They gave us the flower vase set but not the matching paper for some strange reason. Is very cute. Jen, I just LOVE this card (and your work!!) I am currently working on a new blog post and I CASEd this card (with just a couple of changes) for my monthly card making night. I linked back to your blog and this post. Thank you SO MUCH for your wonderful inspiration!! I just love your style!